Is it time you had your next termite inspection Mango Hill? All Corners Carpet Cleaning & Pest Control are your local go-to termite inspection team, specialising in the latest pest control techniques. We provide termite eradication and management services where termites are prevalent across the North Brisbane area. Book your termite inspection with All Corners today. Call Ashley on 0439 722 914 or enquire online here. We provide a number of pest and carpet cleaning services to our clients across the region from Brisbane to the north and further afield. There’s nothing greater than hearing the praise from a happy client like Debbie. Here is what she had to share about her experience. When was your last termite inspection? If you’re unsure or can’t remember, now is as good a time as any. We highly recommend each home has a termite inspection done at least every 12 months so any potential termite activity or damage can be found and treated. It is very important for any species of termites found in your home to be properly identified by a qualified inspector, so the best treatment plan can be put in place. As a home owner or resident, you can also keep an eye out for any termite activity. Check for hard mud tubing or any signs of timber decay or damage. If you suspect any termite activity, do not disturb the area until it has been inspected properly. Even if no termites are detected at one inspection, continue to have regular inspections as conditions can change over time. An inspection will highlight risk conditions such as moisture build up in timber, breaches of termite barriers and untreated or decayed timber on the ground so recommendations can be made to help reduce the risk of termite attack on your home. There are many different ways to go about treating termites and every property and suburb is different. 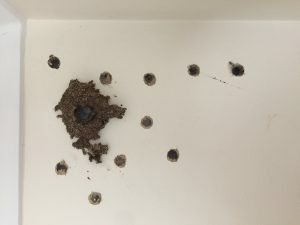 Treating termites directly with termiticides such as Termidor may be possible when large numbers are present or baiting systems may be necessary to gain colony control on the property. Once the initial termite issue is being dealt with, protective measures can be put in place to minimise the risk of future termite attack. One of the best ways to protect your home is the installation of a Termite Chemical Barrier. Prevention really is the best termite protection. Give All Corners a call to discuss the best options to suit you. We’re local, client focused and our aim is to do the best job possible. Keep reading to find out more reasons to choose All Corners. We are family owned and operated and service a wide area including North Lakes, Narangba, Chermside, up to Caboolture and beyond. Discounts are available – ask us for more information about our combined pest control and carpet cleaning services. We understand your need for quality – as carpet cleaning and pest control professionals, quality service is assured on every job. We keep things up-to-date and use the latest in carpet cleaning equipment and pest control techniques. Keep the termites at bay with a termite inspection from the team at All Corners. Give us a call on 0439 722 914 or send us an online message here. All Corners are the leading Carpet Cleaning & Pest Control professionals for the Brisbane Northside. With over a decade of experience in these industries, no job is to big or small. We understand your need for quality! We can help you with Pest and Termite inspections and treatment as well as carpet and upholstery cleaning. For a free no-obligation quote, call us today on 0439 722 914 or send us an online message here. If it looks like there’s white ant activity at your place, it’s time for a termite treatment Brisbane Northside. All Corners are your local pest control provider and with more than 10 years of experience in the industry, we will give you a service that’s not only professional but affordable too. We cover most of Brisbane’s northside including Narangba, Redcliffe, North Lakes, Caboolture, Bracken Ridge and Bray Park. Call Ashley today on 0439 722 914 too book your next treatment or inspection or enquire online here. We like to go above and beyond for our clients because there’s nothing better than a job well done and a happy customer at the end. But when a client goes that one step further and provides us with positive feedback, it’s even better. Here’s what a recent client, Cherie, had to say about All Corners and the job we completed for her. Have a fully qualified pest management technician come out and check your home. All Corners are familiar with all Brisbane North suburbs and will be happy to advise you on the best treatment and management. Once the initial termite issue is dealt with, protective measures can be put in place to minimise the risk of future termite attack. One of the best ways to protect your home is the installation of a Termite Chemical Barrier which All Corners can advise you on. As with most things, prevention really is better than the cure! Give us a call to discuss all the available options and which would suit your property best. Discounts are available – ask us for more information about our discounted combined pest control and carpet cleaning services. No job is too big or small for us – we have over 10 years of experience in the carpet cleaning and pest control industries. We provide all aspects of pest control, termite control and carpet and upholstery cleaning to all areas in North Brisbane. Say goodbye to termites, rogue bugs and insects with the help of the All Corners team. Get your free no-obligation quote, either over the phone or in person. Call Ashley today on 0439 722 914 or enquire online here. Have you found yourself surrounded by pesky bugs and are now looking for the best in Pest control Brisbane North Lakes? All Corners Carpet Cleaning & Pest Control have you covered, using the latest in pest control techniques and carpet cleaning equipment. As a family owned and run business, we cover the northside of Brisbane and beyond and offer our customers the best quality service at a price they can afford. To find out more about what we offer and how we can help you, call us on 0439 722 914 or enquire online here. We quite often get called out to jobs that combine our pest control and carpet cleaning services. We love nothing more than hearing from our happy clients after a successful job is completed. At All Corners we offer our clients both pest control and carpet cleaning services, at great rates. We use the latest in pest control techniques to achieve the best results for you. Whether it be an ant infestation, cockroaches crawling out to terrify you or signs of termites, we tailor make a pest management program to suit you and your home. We provide termite inspections and termite control with eradication and management services across the region where termites are prevalent. It is important that regular inspections are done by a licensed inspector at least every 12 months. We use the latest in carpet cleaning machinery, achieving the best results every time. Our high powered truck mount machinery provides maximum heat and suction giving your carpet and upholstery the best clean possible with a walk on dry time of about 2 hours. The rinsing agents we run through our solution lines, leave your carpets feeling soft and staying cleaner for longer. Family owned and operated, we service a wide area including North Lakes, Narangba, Chermside, up to Caboolture and beyond. For all your pest control and carpet cleaning needs, look no further than the team at All Corners. To get your free no obligation quote call Ashley today on 0439 722 914 or send us an online message here. A customer contacted us with a large mud ball hanging out of her wall. Being close to Narangba at the time I was able to stop in and have a look for her. After the first look I let her know it was definitely Termites. I conducted a full Termite Inspection of the home and the Termite activity was Isolated to this wall. We treated the Nest with Termidor foam to eliminate the Termites from the home and installed a Termite Chemical Barrier for her to help reduce the risk of future Infestation. These instances aren’t isolated to Narangba, we get phone calls from all over North Brisbane, Mango Hill, North Lakes, Redcliffe etc. to these sorts of situations. I highly recommend regular Termite Inspections and a Termite Management Plan to combat Termite activity on your property.